Aertv Director Philippe Brodeur attended the Good Food Ireland Awards last month in Dublin city centre. Also in attendance were An Taoiseach Enda Kenny TD, Rory O’Connell of Ballymaloe Cookery School, Margaret Jeffares, Managing Director and CEO of Good Food Ireland, and Peter Ward of Country Choice. Philippe Brodeur and Enda Kenny TD co-presented a key award at the event. The following photographs from the event appeared in Public Sector Magazine on 18th December 2013. 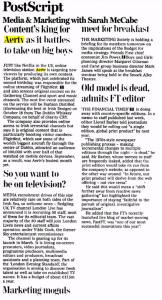 Aertv and SportsLive were featured in the Irish Independent Fit Magazine in an article written by Breifne Earley. Breifne is an athlete who has overcome many challenges in his life, including living with, and managing depression. He has participated in and achieved so much in the last few years, and Aertv SportsLive are delighted to be the official Live Video Streaming Partners for the Challenge Ten event. Challenge Ten will involve Breifne taking part in the World Cycle Race in March. Aertv and Basketball Ireland were in the news over the past week for all the right reasons, as Aertv streamed not one but two live Basketball Premiere League matches last Saturday. We saw the UL Huskies take on the WIT Wildcats in the ladies’ fixture, and for the men’s, the Belfast Star faced off against the UL Eagles. Aside from the high number of viewers and basketball fans who watched our live stream on Saturday, several national newspapers also featured the event, and Aertv, including The Irish Daily Star, The Herald, The Evening Echo, The Irish Independent and the Irish News. See further details below. Aertv Director Philippe Brodeur spoke with George Hook on Newstalk’s The Right Hook on Friday regarding the announcement of UTV’s first terrestrial TV channel specifically for the Irish Republic. Philippe discusses how this development will impact existing Irish channels, and what it means for consumers and audiences alike. Aertv and Basketball Ireland have extended their partnership for the 2013/14 season. The online streaming provider will broadcast games from the men’s and women’s premier league throughout the season. The move follow’s Aertv broadcasting the playoff finals for both leagues last season. Aertv’s first broadcast of the new season was the visit of DCU Saints to newcomers Templeogue. DCU won 84-79. AerTV is to launch Ireland’s first Live and Video on Demand Sports platform, according to Rob Hartnett’s ‘Sport for Business’organisation. AerTV SportsLive will enable Irish sporting organisations to provide a global audience with video content from their events, as well as the kind of rich digital content that brings people into sport as players, fans or commercial partners. We love a good info-graphic. Feel free to share Aertv’s story so far! Irish-owned online television service Aertv has celebrated its second birthday by announcing it has hit the 6m viewer milestone. 5 budgeting tips for college students who are looking for cheaper ways to live a prestigious lifestyle! Click on the image to read the full article below.